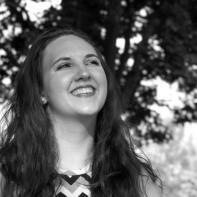 Kaylee Duff is a senior at Bowling Green State University, where she is currently pursuing a BFA in Creative Writing. Her work has appeared or is forthcoming in several journals, including Pamplemousse, Gertrude, and Catfish Creek. One night, I dreamt about my father. He walked slowly to his car, turning around to wave goodbye one last time. “Don’t forget to water my plants, darling.” And then he backed away until he dissolved into the wind. That was thirty days after my father abandoned us. The next day, I came home from school to an empty house. Sunlight filtered in through windows, illuminating dust floating lazily through the air. A formless, spring day like any other. The back door stood open. I walked outside into the soft heat. And my mother was in the backyard. She sat, legs crossed, fingers plunged deep into the ground. I went inside to finish my homework. That night was the first meal I ate alone. The next morning, she was still out there. She was laying on her back, fingers still pressed into the dirt. She wasn’t dead; she breathed in time with the rhythm of the earth below. Grass sprouted down her legs. Her arms became patches of forget-me-nots. Her chest was opened to the sky. Our neighbor came over to visit. She seemed to understand what was going on better than I did. “Your father’s leaving was hard on her.” She found a watering can and poured water on my mother. I watched it rain down over her face, pooling in her eye sockets on top of closed eyelids. Months passed. The smell of lilies and peonies and hydrangeas and lavender filled the air. Tulips and daffodils covered my mother’s neck. Her toes were crumbling away. But my mother—she didn’t move. Bills piled up on the table, calls went unanswered, unreturned. People started to notice with growing alarm that my mother was missing. But what was there to do? She was growing, changing, evolving into something that didn’t need me. Roots filled her lungs and curled around her ribs. Stems burst through her skin. Her blood was replaced with soil and seed, her bones with rock. Fed up, I considered my options. Herbicide? Dig her up? Use her to grow food for my solitary meals? In the end, of course, I chose nothing. I chose to stay. My heart turned to stone; loneliness, like a rose, bloomed deep in my stomach. My mother decomposed into the earth. She became a garden. I become a statue. Covered eventually in vines and moss. Only there because I had nowhere else to go.